The Emerald Hill Festival is a collaboration between Australian National Academy of Music (ANAM), Arts Access Victoria, Australian Tapestry Workshop, Emerald Hill Library & Heritage Centre, Multicultural Arts Victoria and the South Melbourne Police. The one day event takes place in and around South Melbourne Town Hall. We'll be performing at the Nebula performance space (pictured), a unique portable venue designed specifically with disability access in mind. We're on at 10am, so we'll see you all bright and early. Where: Nebula Performance Space, near Arts Access Victoria, 222 Bank St South Melbourne. When: 10am, Sunday 9 November 2014. 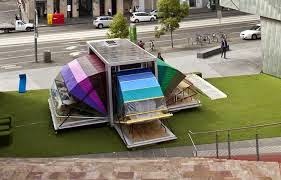 Nebula is a fully accessible, portable performance space. We'll be performing there as part of the Emerald Hill Festival at 10 am on Sunday 9 November.